TeachingLD is a service of the Division for Learning Disabilities (DLD) of the Council for Exceptional Children. DLD is an international professional organization devoted to helping individuals with Learning Disabilities succeed. 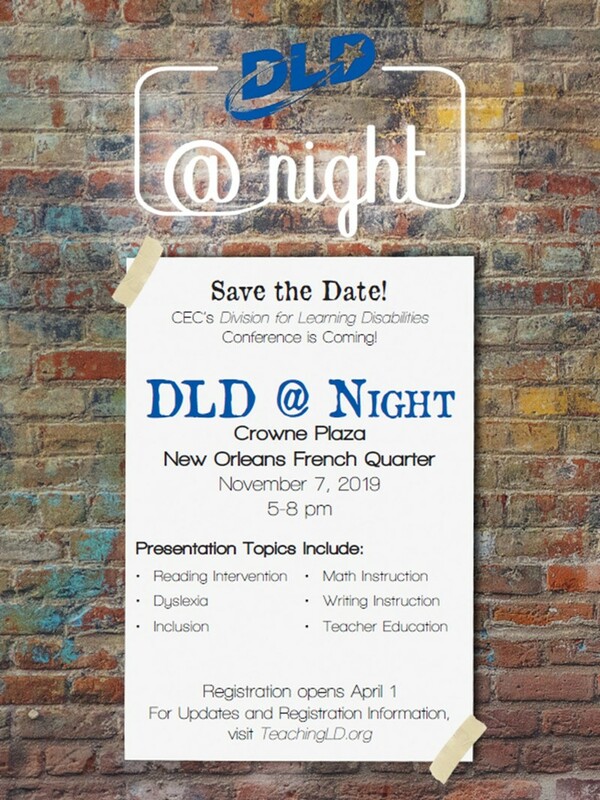 DLD is hosting a mini-conference in New Orleans this fall and we would love to see you there! Check out our Events page for more details. Congratulations to all of our DLD Award winners! You work so hard each day to improve the lives of those with Learning Disabilities and we appreciate all that you do! To learn more about our esteemed recipients, check out the Awards page and our Blog! Thank you to everyone who made CEC 2019 a success! DLD was quite busy in Indy. With committee meetings, sessions, the DLD Showcase, and our Student Poster Session and Reception there was never a dull moment! Catch up about these events and more through our Blog! Kristin Sayeski moves into her new role as Current President, Michael Faggella-Luby steps up as President Elect, and William Therrien is appointed as Vice President. We appreciate all of the work of Stephanie Al Otaiba as she moves to Past President. DLD also welcomes new Executive Director Miriam Ortiz! We look forward to a busy and productive year advancing the mission of DLD! Find out more about how YOU can get involved with DLD by contacting one of our Board members here.